static char * ST_OK = "Ok"
static char * ST_EOF = "Premature end of file." static char * ST_NO_CONSTRAINT = "Can't read constraint definition." static char * ST_NO_FILE = "Can't open BVH file." static char * ST_NO_HIER = "Invalid HIERARCHY header." static char * ST_NO_JOINT = "Can't find ROOT or JOINT." static char * ST_NO_NAME = "Can't get JOINT name." static char * ST_NO_OFFSET = "Can't find OFFSET." static char * ST_NO_CHANNELS = "Can't find CHANNELS." static char * ST_NO_ROTATION = "Can't get rotation order." static char * ST_NO_AXIS = "Can't get rotation axis." static char * ST_NO_MOTION = "Can't find MOTION." static char * ST_NO_FRAMES = "Can't get number of frames." static char * ST_NO_FRAME_TIME = "Can't get frame time." static char * ST_NO_POS = "Can't get position values." static char * ST_NO_ROT = "Can't get rotation values." static char * ST_NO_XLT_FILE = "Can't open translation file." static char * ST_NO_XLT_HEADER = "Can't read translation header." static char * ST_NO_XLT_NAME = "Can't read translation names." static char * ST_NO_XLT_IGNORE = "Can't read translation ignore value." static char * ST_NO_XLT_RELATIVE = "Can't read translation relative value." static char * ST_NO_XLT_OUTNAME = "Can't read translation outname value." static char * ST_NO_XLT_MATRIX = "Can't read translation matrix." static char * ST_NO_XLT_MERGECHILD = "Can't get mergechild name." static char * ST_NO_XLT_MERGEPARENT = "Can't get mergeparent name." static char * ST_NO_XLT_PRIORITY = "Can't get priority value." static char * ST_NO_XLT_LOOP = "Can't get loop value." static char * ST_NO_XLT_EASEIN = "Can't get easeIn values." static char * ST_NO_XLT_EASEOUT = "Can't get easeOut values." static char * ST_NO_XLT_HAND = "Can't get hand morph value." static char * ST_NO_XLT_EMOTE = "Can't read emote name." Definition at line 197 of file llbvhloader.h. Definition at line 206 of file llbvhloader.h. Definition at line 126 of file llbvhloader.cpp. References applyTranslations(), getLineNumber(), llendl, llwarns, loadBVHFile(), loadTranslationTable(), mInitialized, mStatus, optimize(), reset(), S32, ST_NO_XLT_FILE, ST_OK, and TRUE. Definition at line 161 of file llbvhloader.cpp. Definition at line 972 of file llbvhloader.cpp. References FALSE, LLVector3::magVec(), Translation::mFrameMatrix, Translation::mIgnore, mJoints, Translation::mMergeChildName, Translation::mMergeParentName, Translation::mOffsetMatrix, Translation::mOutName, mPriority, Translation::mPriorityModifier, Translation::mRelativePosition, Translation::mRelativePositionKey, Translation::mRelativeRotationKey, mTranslations, and TRUE. Definition at line 264 of file llbvhloader.h. Definition at line 1262 of file llbvhloader.cpp. References BVH_PARSER_LINE_SIZE, FALSE, mLine, mLineNumber, and TRUE. Definition at line 251 of file llbvhloader.h. Definition at line 1278 of file llbvhloader.cpp. Definition at line 268 of file llbvhloader.h. Definition at line 266 of file llbvhloader.h. Definition at line 631 of file llbvhloader.cpp. References depth, find_next_whitespace(), i, j, mDuration, mFrameTime, mJoints, mLineNumber, mLoop, mLoopOutPoint, mNumFrames, Joint::mOrder, Key::mPos, Key::mRot, p, S32, ST_EOF, ST_NO_AXIS, ST_NO_CHANNELS, ST_NO_FRAME_TIME, ST_NO_FRAMES, ST_NO_HIER, ST_NO_JOINT, ST_NO_MOTION, ST_NO_NAME, ST_NO_OFFSET, ST_NO_POS, ST_NO_ROT, ST_NO_ROTATION, ST_OK, and TRUE. Definition at line 169 of file llbvhloader.cpp. References LLStringBase< char >::compareInsensitive(), CONSTRAINT_TYPE_PLANE, CONSTRAINT_TYPE_POINT, FALSE, gDirUtilp, LLDir::getExpandedFilename(), getLine(), LLVector3::isExactlyZero(), ll_apr_file_open(), LL_APR_R, LL_MAX_PATH, LL_PATH_APP_SETTINGS, llendl, llinfos, Constraint::mChainLength, mConstraints, Constraint::mConstraintType, mDuration, mEaseIn, Constraint::mEaseInStart, Constraint::mEaseInStop, mEaseOut, Constraint::mEaseOutStart, Constraint::mEaseOutStop, mEmoteName, Translation::mFrameMatrix, mHand, Translation::mIgnore, mLine, mLineNumber, mLoop, mLoopInPoint, mLoopOutPoint, LLMatrix3::mMatrix, Translation::mMergeChildName, Translation::mMergeParentName, Translation::mOffsetMatrix, Translation::mOutName, mPriority, Translation::mPriorityModifier, Translation::mRelativePosition, Translation::mRelativePositionKey, Translation::mRelativeRotationKey, Constraint::mSourceJointName, Constraint::mSourceOffset, Constraint::mTargetDir, Constraint::mTargetJointName, Constraint::mTargetOffset, mTranslations, LLVector3::mV, LLVector3::normVec(), NULL, S32, LLVector3::setVec(), ST_EOF, ST_NO_CONSTRAINT, ST_NO_XLT_EASEIN, ST_NO_XLT_EASEOUT, ST_NO_XLT_EMOTE, ST_NO_XLT_FILE, ST_NO_XLT_HAND, ST_NO_XLT_HEADER, ST_NO_XLT_IGNORE, ST_NO_XLT_LOOP, ST_NO_XLT_MATRIX, ST_NO_XLT_MERGECHILD, ST_NO_XLT_MERGEPARENT, ST_NO_XLT_NAME, ST_NO_XLT_OUTNAME, ST_NO_XLT_PRIORITY, ST_NO_XLT_RELATIVE, ST_OK, TRUE, type, VX, VY, VZ, x, y, and z. Definition at line 1081 of file llbvhloader.cpp. References bvhStringToOrder(), dist_vec(), f, factor, FALSE, lerp(), llmax(), mayaQ(), mDuration, mEaseIn, mEaseOut, mJoints, mLoop, order, POSITION_KEYFRAME_THRESHOLD, POSITION_MOTION_THRESHOLD, ROTATION_KEYFRAME_THRESHOLD, ROTATION_MOTION_THRESHOLD, S32, TRUE, LLVector3::x_axis, and LLVector3::y_axis. Definition at line 1240 of file llbvhloader.cpp. References FALSE, mDuration, mEaseIn, mEaseOut, mEmoteName, mFrameTime, mHand, mInitialized, mLineNumber, mLoop, mLoopInPoint, mLoopOutPoint, mNumFrames, and mPriority. Definition at line 1287 of file llbvhloader.cpp. References bvhStringToOrder(), LLVector3::clamp(), f, F32_to_U16(), INCHES_TO_METERS, KEYFRAME_MOTION_SUBVERSION, KEYFRAME_MOTION_VERSION, LL_MAX_PELVIS_OFFSET, LLQuaternion::loadIdentity(), mayaQ(), mConstraints, mDuration, mEaseIn, mEaseOut, mEmoteName, Joint::mFrameMatrix, mFrameTime, mHand, mJoints, Joint::mKeys, mLoop, mLoopInPoint, mLoopOutPoint, Joint::mOffsetMatrix, Joint::mOrder, mPriority, LLVector3::mV, NULL, order, LLDataPacker::packBinaryDataFixed(), LLDataPacker::packF32(), LLDataPacker::packS32(), LLDataPacker::packString(), LLQuaternion::packToVector3(), LLDataPacker::packU16(), LLDataPacker::packU32(), LLDataPacker::packU8(), LLDataPacker::packVector3(), LLVector3::quantize16(), S32, LLVector3::setVec(), LLQuaternion::shortestArc(), TRUE, VX, VY, VZ, x, y, z, and LLVector3::z_axis. Referenced by getOutputSize(), and LLFloaterAnimPreview::postBuild(). Definition at line 199 of file llbvhloader.h. Definition at line 282 of file llbvhloader.h. Referenced by loadTranslationTable(), and serialize(). Definition at line 297 of file llbvhloader.h. Referenced by getDuration(), loadBVHFile(), loadTranslationTable(), optimize(), reset(), and serialize(). Definition at line 289 of file llbvhloader.h. Referenced by loadTranslationTable(), optimize(), reset(), and serialize(). Definition at line 290 of file llbvhloader.h. Definition at line 292 of file llbvhloader.h. Referenced by loadTranslationTable(), reset(), and serialize(). Definition at line 280 of file llbvhloader.h. Referenced by loadBVHFile(), reset(), and serialize(). Definition at line 291 of file llbvhloader.h. Definition at line 294 of file llbvhloader.h. Referenced by isInitialized(), LLBVHLoader(), and reset(). Definition at line 281 of file llbvhloader.h. 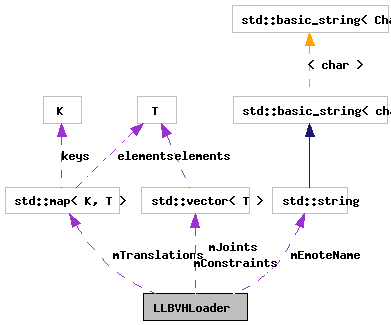 Referenced by applyTranslations(), loadBVHFile(), optimize(), serialize(), and ~LLBVHLoader(). Definition at line 275 of file llbvhloader.h. Referenced by getLine(), and loadTranslationTable(). Definition at line 276 of file llbvhloader.h. Referenced by getLine(), getLineNumber(), loadBVHFile(), loadTranslationTable(), and reset(). Definition at line 286 of file llbvhloader.h. Referenced by loadBVHFile(), loadTranslationTable(), optimize(), reset(), and serialize(). Definition at line 287 of file llbvhloader.h. Definition at line 288 of file llbvhloader.h. Referenced by loadBVHFile(), loadTranslationTable(), reset(), and serialize(). Definition at line 279 of file llbvhloader.h. Referenced by loadBVHFile(), and reset(). Definition at line 285 of file llbvhloader.h. Referenced by applyTranslations(), loadTranslationTable(), reset(), and serialize(). Definition at line 295 of file llbvhloader.h. Referenced by getStatus(), and LLBVHLoader(). Definition at line 283 of file llbvhloader.h. Referenced by applyTranslations(), and loadTranslationTable(). Definition at line 208 of file llbvhloader.h. Referenced by loadBVHFile(), and loadTranslationTable(). Definition at line 217 of file llbvhloader.h. Definition at line 215 of file llbvhloader.h. Definition at line 209 of file llbvhloader.h. Definition at line 210 of file llbvhloader.h. Definition at line 220 of file llbvhloader.h. Definition at line 219 of file llbvhloader.h. Definition at line 211 of file llbvhloader.h. Definition at line 212 of file llbvhloader.h. Definition at line 218 of file llbvhloader.h. Definition at line 213 of file llbvhloader.h. Definition at line 214 of file llbvhloader.h. Definition at line 221 of file llbvhloader.h. Definition at line 222 of file llbvhloader.h. Definition at line 216 of file llbvhloader.h. Definition at line 234 of file llbvhloader.h. Definition at line 235 of file llbvhloader.h. Definition at line 237 of file llbvhloader.h. Definition at line 223 of file llbvhloader.h. Referenced by LLBVHLoader(), and loadTranslationTable(). Definition at line 236 of file llbvhloader.h. Definition at line 224 of file llbvhloader.h. Definition at line 226 of file llbvhloader.h. Definition at line 233 of file llbvhloader.h. Definition at line 229 of file llbvhloader.h. Definition at line 230 of file llbvhloader.h. Definition at line 231 of file llbvhloader.h. Definition at line 225 of file llbvhloader.h. Definition at line 228 of file llbvhloader.h. Definition at line 232 of file llbvhloader.h. Definition at line 227 of file llbvhloader.h. Definition at line 207 of file llbvhloader.h. Referenced by LLBVHLoader(), loadBVHFile(), and loadTranslationTable().